See KPRA Events for more info. The Listen Link is now up and running. Click on the Listen to KPRA link and enjoy listening to our net on the web. Echolink users use KE6TZG-R to talk and listento our repeater. we are on back-up power. The Keller Peak Repeater Association is dedicated to serving our community via Ham Radio. 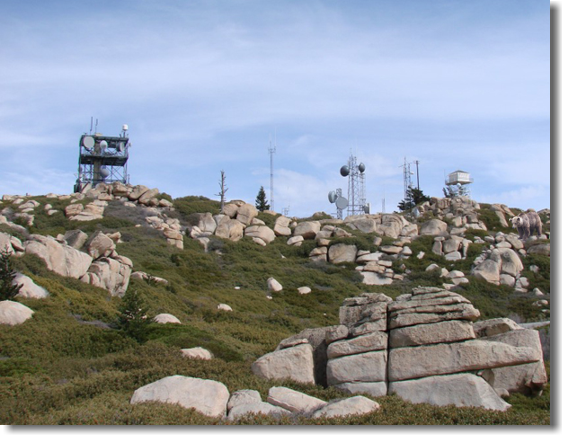 KPRA owns and operates an open amateur radio repeater with an input of 146.985 and output of 146.385, located on Keller Peak at approximately 8,000 feet, in the San Bernardino, California, mountains. There is a 146.2 CTCSS tone required at this time. We would like to invite everyone to check in take part in the various Nets that are held on this repeater. Below is a partial list of the Nets. Click here for more information on our nets. For those who are up late (or up very early). This Net is intended for all of the regional hospitals and trauma centers to test their installed amateur radio systems. This Net is for those who like to combine amateur radio with off-road fun. The Salvation Army Team Emergency Radio Network: Riverside/San Bernardino Counties Section. The ARRL National Traffic System (NTS) is a well-organized system for routing formal written message traffic (radiograms) from any point in the United States to any other. This is where you can sit back and unwind, learn a little, and have fun all the while. Find out more about how you can prepare yourself and your family — at home, at work, or at play. Learn how NOW!. Click to see Weather and Solar Data. We at KPRA are happy to make this page available. Please feel free to download any or all of the available documents. Enjoy and don't be shy. If you have comments about this site, please contact the Webmaster. Website design, graphics, and coding by Joe Mabry-KI6HPP. Last Updated: September 24, 2015.